We have been looking for a pruner for our rose bush which we uprooted from one area of our house to another area several years ago. I didn't want anything huge, but kitchen shears were just not cutting it. These Ezy Pruners are perfect for the job and even do small tree limbs. One of the things I have always wanted when we own our home (we currently rent) are some fruit trees. A few Apple, Pear, and maybe a peach tree, as well as a garden with that comes needing garden tools to be able to get the job done right. After a while we may need to buy a larger set but for now this set is just perfect. Easy to use comes in Black or Red. We have ours in Red. I love how they ratchet and cut without having to use too much strength which I do not have. You can find the Ezy Pruner on Amazon. 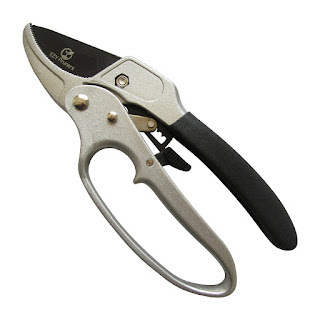 If you've ever tried cutting medium sized branches, but have found it a struggle using regular Pruning Shears... then, you'll love using these Ezy Pruners! The way in which these Ratchet Pruners work is they have a ratcheting mechanism in place that takes care of as much as 80% of the workload for you! All you have to do is to place the jaws of the anvil blade around the object that you're wanting to cut, like you would an ordinary pruner... grip the handles, squeeze ever so gently until you hear a locking sound... and as simple as 3 easy squeezes... you'll have a nice clean cut right before you! No more struggling to cut tough branches of wood, and getting nowhere! What Kind of Cuts Can You Expect From These? Your Ezy Pruners will make short work of hard branches of up to 1" thick. Though, this doesn't mean you need to only save these for those bigger tasks... you will find your ratchet pruners are great for trimming flower stems, getting rid of dead plants, or any small to medium pruning task, really!